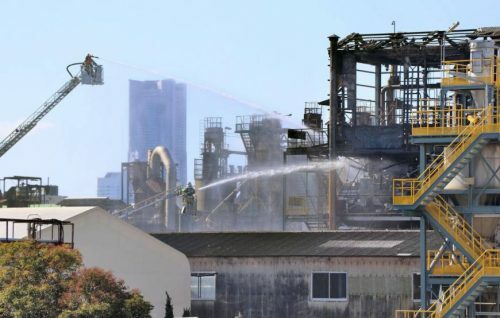 Four people hurt, including a man who was seriously injured in Yokohama Monday when an explosion set off a fire at an agricultural chemicals factory, police said. The fire broke out at around 9 a.m. at a five-story factory run by SDS Biotech K.K. about 800 meters south of JR Shin-Koyasu Station. The factory was in operation at the time of the fire. “I saw heaps of black smoke climbing into the sky,” said a 76-year-old woman employed at a nearby building. The fire had been extinguished by around noon and investigators were looking into the cause.